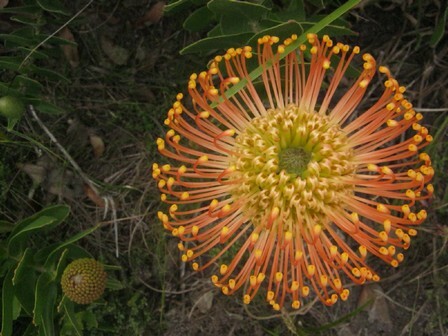 Leucospermum bolusii E.Phillips, Leucospermum mixtum E.Phillips, Leucospermum nutans R.Br. A population reduction of nearly 30% is estimated based on a 34% reduction in range size (EOO) and 29% reduction in AOO as a result of habitat loss and extensive picking of planted and wild plants in the past 60 years (generation length 20 years). This is the most popular horticultural Pincushion. 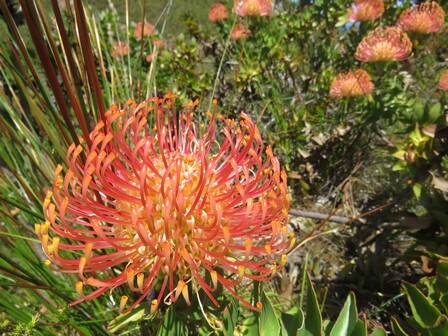 Many cultivars are available and are planted extensively in protea orchards adjacent to natural stands throughout its range. Contamination of natural gene pools is thus a major concern, together with habitat loss due to alien plant invasion and agriculture.